I know, I know...you've seen a hundred gift guides. This is not a gift guide, this is what I genuinely want for Christmas ; ). I've learned over the years wish lists are KEY to not being disappointed on Christmas morning. Alex and I will usually set an amount around $100 to spend on each other, and he doesn't stray from my list. Are you specific with gifts you want or are you less picky? Here are a few a few things I would love to have wrapped under my tree this year! 1. James Avery Script Initial Ring - I tried these sterling silver rings on during Black Friday and fell in LOVE! I've wanted some piece of jewelry to symbolize my kids, and these aren't corny and look adorable stacked together. $50 per ring isn't crazy either! James Avery Jewelry, headquartered in Texas, has been a brand I've worn since I was a child. I can't wait to buy Whitney her first charm bracelet. 2.) Zeel Massage on Demand - Zeel massage delivers spa-quality massages to your home, 7 days a week, 365 days a year from 7am-10:30pm. I would love their spa package which includes a plush robe, massage table sheet set, relaxing sage candle, a bottle of Frangipanie Oil by Elemis and a 60 min. massage. Put the kids to bed and have a massage in my own home...yes please! They offer Swedish, chair, sports, deep tissue, prenatal and couple massages. 3.) 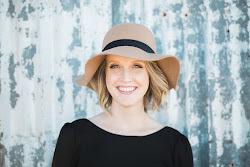 Sunfern Studio Joanna Necklace - I recently discovered Austin based Sunfern Studio on Instagram and immediately became obsessed! This necklace would bring so much life to my simple/neutral outfits. 4.) Sticky9 Magnets - If you've been in my house you've seen my refrigerator door covered in Sticky9 magnets. I would love to cover my ENTIRE fridge in them. I desperately need to add photos of the babies, since the last time I printed magnets was before I was even pregnant with them. I spend a lot of time in my kitchen feeding kids and cleaning, and these magnets bring me so much joy and add lots of color and life to my kitchen. You can choose Instagram photos or any photo from your computer/phone to print. They come in sheets of 9 magnets. 5.) Cleaning Service - If I could have someone come to my house once a month to deep clean, I would be in heaven. Seriously though....this might be the most boring but best gift of all time to a busy mom! 6.) Sunfern Studio Lori Necklace - What do I really need to say. I love everything about this necklace! Maria Soltera handmakes each one of these and her work is beautiful. 7.) J.Crew / Carl Estime Glitter Boots - Ok, this is an extravagant want but it's fun dreaming. Honestly I would never spend $400 on boots unless I could wear them with everything. 8.) Lush Bath Bomb Gift Set - I recently discovered Lush at their new store front in the Domain and would love to try out their popular bath bombs. I'm kind of over ninja turtle bubble bath. There you have it! 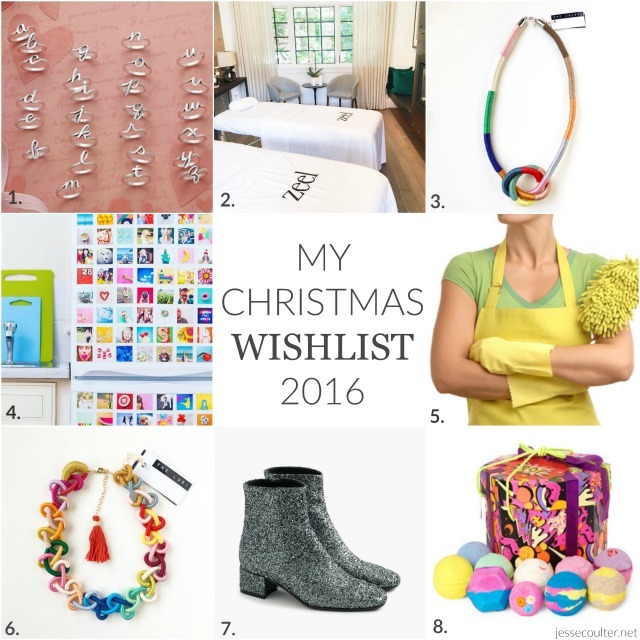 My 2016 Christmas wish list covers things from fashion to relaxation to practicality. What's on your wish list this year? I would love to know! Re: Cleaning service. I live in Austin and I've been using Maids by Melissa for over a year. They're super affordable and do a great job. It's SO nice to not have to deep clean anymore. But Jesse, those glitter boots DO go with everything! Ugh they're so beautiful I could cry. The magnet idea is so cute!